Of course, FTD, a firm believer in, "piss or get off the pot," says, "Screw the nappy, just let him piss himself a few times. He'll eventually figure it out." As much as I want to say, Fine! then you clean the sheets every night!, I know from prior potty training mistakes, pushing can cause HUGE issues. My original plan for night time potty training was to do nothing until Ollie showed signs of being ready.Which, according to everything I have read, two weeks of waking up with dry diapers. 1. 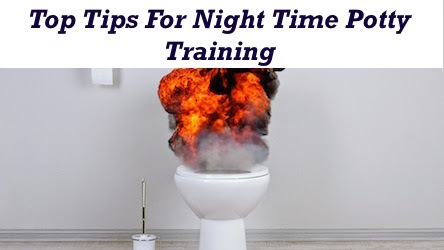 The child HAS TO BE READY- Night time potty training is more a Physiological Developmental Milestone than a learned skill. Wait until at least a week of waking with dry diapers happens before even thinking about beginning night time training. 2. Get a waterproof mattress pad, and a few disposable puppy pee pads for under the top sheet to make changing the sheets in the middle of the night less painful. One tip recommended layering the sheets and pee pads to make multiple night accidents easy to change. 3. Limit liquids before bed. 4. Have child use the potty right before going to bed. 5. Never shame the child for accidents. Scolding will only cause regression. And no one wants that! 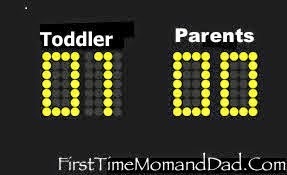 One "mom tip" I kept seeing was, "Before going to bed, wake your child up and take him/her to the potty. Do this for 2-weeks straight, and your child will learn to do it on their own." I'd try it, but I'm afraid I'll never get him back to sleep. The kid is as chatty as me! Still, as much as FTD says let him pee, I say no way. The plan is to be more diligent about limiting liquids, making him pee before bed, and paying close attention to him when he wakes up. Possibly even try to check him for a dry diaper right before he wakes up. Sure, I'm WAY over buying diapers, but I'd much rather pee nappies than constant pee sheets! What's your night time potty training plan?